Photo: Home located in the Upper Main Street Historic District, Hatfield, Hampshire County, MA. The Historic District was listed on the National Register of Historic Places in 1994. Photographed by User:John Phelan (own work), 2012, [cc-by-3.0 (creativecommons.org/licenses/by/3.0)], via Wikimedia Commons, accessed September, 2013. Created in 1662, Hampshire County functions were taken over by state agencies in 1999. 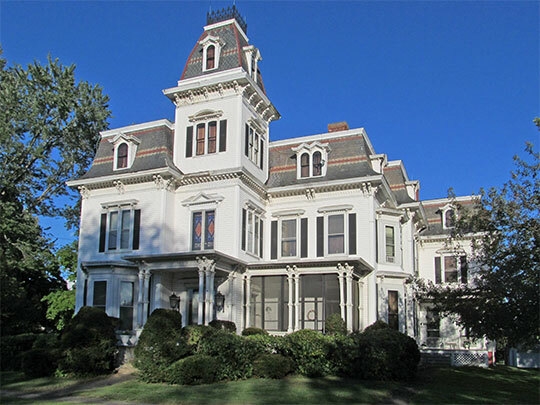 The Hampshire Council of Governments, an organization with volunteer membership, has offices on the second floor of the Old Hampshire County Courthouse, 99 Main Street, Northampton, MA 01060; phone: 413-584-1300. The Old Courthouse was designed by architect Henry F. Kilbourn in the Richardsonian Romanesque style of Henry Hobson Richardson. The cornerstone was laid in August of 1886 and the building was dedicated in December, 1887.